MUENSTER, Germany -- Europe is at risk, we are told. Russia’s assault on Ukraine threatens the post-Cold War order. Moscow may follow up with similar attacks on Moldova and even such NATO members as Estonia, Latvia, and Lithuania. 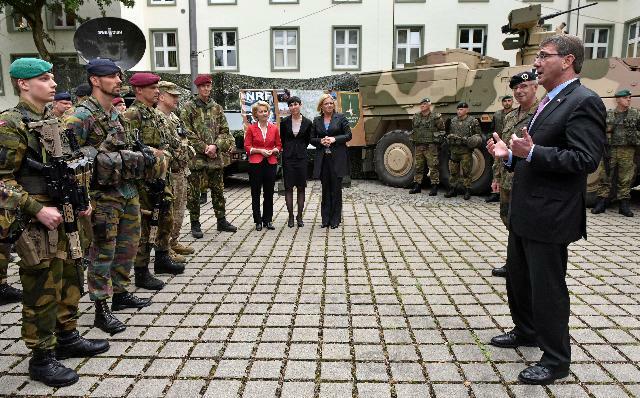 US Secretary of Defense Ash Carter, right, addresses NATO Response Force soldiers during his visit to the I. German-Dutch Brigade in Muenster, Germany, Monday, June 22, 2015. The troops are part of NATO’s Very High Readiness Joint Task Force (VJTF). But no one in Europe seems to care. Even the countries supposedly in Vladimir Putin’s gun sites aren’t much concerned. No one is bolstering their military. And the European people oppose taking any military risks to help their neighbors. Unfortunately, the Ukraine crisis is likely to continue for some time. The allies hope sanctions will bring Moscow to heel, but the Pew Research Center found that 88 percent of Russians backed Vladimir Putin’s foreign policy, the highest number since Pew started polling in 2003. At least Putin, though no friend of the West, is no fool. But if Putin changes his mind, the Europeans don’t plan on defending themselves. Instead, virtually everyone expects America to save them, if necessary. Washington is being played for a sucker as usual. Defense Secretary Ashton Carter is visiting Europe this week. Americans will provide intelligence, logistics, reconnaissance, and surveillance support. Separately, the Obama administration plans to pre-position tanks and other equipment for a combat brigade in seven nations in Eastern Europe. America is more committed to Europe than are Europeans. “We are moving forward together, with new capabilities,” he said. What does he mean by “we”? Washington again will do the heavy lifting. “You can nearly hear the sigh of relief in Europe,” said Heather Conley of the Center for Strategic and International Studies, in learning that the U.S. again would bail out its allies. The Europeans scrimp on the military while funding their generous welfare state. They promise Washington whatever it desires—to increase outlays, hit the two percent of GDP level, improve international coordination, and more. Then they will go back to doing what they do best, depend on America. NATO always stood for North America and the Others. During the Cold War the allied states shamelessly took a very cheap ride on the U.S.
That made sense in the immediate aftermath of World War II, but by the 1960s Europe had recovered and should have spent amounts commensurate with the Soviet threat. However, Europeans correctly gauged that Washington wouldn’t leave, despite periodically upbraiding them for their meager efforts. The problem has gotten worse in recent years. The U.S. accounts for three-quarters of NATO outlays even though Europe has a larger GDP than America. Because of European cutbacks, overall outlays are down 1.5 percent this year. Of 28 members only the U.S., Britain, and Greece—mostly because of its confrontation with fellow alliance member Turkey—typically broke the officially recommended level of two percent of GDP. Estonia has become a member of that exclusive club, but not Latvia and Lithuania, despite being on the front line. After frenetically demanding that the U.S. do more, Poland only hit that mark this year. But several members have been cutting outlays, despite the continent’s embarrassing showing against Libya (running out of missiles, for instance) and limited capacity to aid the Baltics (little more than nil) let alone defend a nation like Ukraine. Of the five largest European defense budgets, only France’s will increase. Those of Canada, Germany, Great Britain, and Italy will continue to decline. None of these countries will hit the recommended two percent of GDP level in 2015. Only Britain and France exceed 1.5 percent. Canada barely makes one percent. Those NATO members spending more this year—Estonia, Latvia, Lithuania, Poland, Netherlands, Norway, and Romania—collectively have outlays only half that of Britain. Cooperation is poor even among those most at risk. Add Poland to the three Baltic and five Nordic states and the group enjoys a GDP about a third larger than that of Russia. However, their military outlays are only about 40 percent of Moscow’s. Never mind the events of the last year. Ukraine has not served as Thomas Jefferson’s famed “fire bell in the night,” despite the supposedly terrible threat posed to the peace and stability of Europe. “It is much more business as usual,” said British defense analyst Ian Kearns. As of 2013 the Europeans devoted just 3.6 percent of their governments’ budgets to the military, compared to a fifth of U.S. government spending. America’s per capita military outlays are five times that of the alliance’s Cold War members and eight times that of those states which joined later. “Total military spending by NATO’s European members was less in real terms in 2014 than in 1997—and there are 12 more member states in NATO today,” observed my Cato Institute colleague Chris Preble. The issue is more than just money. From the onset of the crisis with Russia a number of American analysts have proposed deploying U.S. forces to Ukraine, treating the latter as if it was a NATO ally. No Europeans have volunteered to follow. The U.S. House has approved legislation to arm Kiev’s forces, and a similar measure is being pushed by ever warlike Senate Armed Services Committee Chairman John McCain. Most European governments have resisted the idea. “Make no mistake: we will defend our allies,” declared Carter. But will the Europeans defend anyone, even themselves? A new poll suggests not. If Russia got into a conflict with another member of NATO, should your country use military force in the victim’s defense? A majority of French, Germans, and Italians said no. Only pluralities said yes in Poland, Spain, and the United Kingdom. The highest European support level was in Britain, at 49 percent. Only in America, naturally, and Canada did a majority say yes (56 and 53 percent, respectively). Yet why should they take action as long as they believe they can count on Washington to save them? According to Pew, two-thirds of Europeans were convinced the Americans would come rushing over to do what they would not do for themselves. It will not do so as long as U.S. policymakers insist that Americans do the job instead. Moscow is an unpleasant regional actor, not a global threat. Europe has a much larger GDP and population than Russia and even with its current anemic level of military outlays devotes more to defense. The U.S. government is essentially bankrupt, with far greater unfunded liabilities than the Europeans, despite Greece’s travails. Instead of pouring more resources into NATO, Washington should be disengaging militarily, turning leadership of the alliance and responsibility for defending the continent over to Europe. Americans shouldn’t be expected to protect their rich cousins even if the latter were devoted to protecting each other. That the Europeans expect the U.S. to do their job is yet another reason for Americans to say no more.